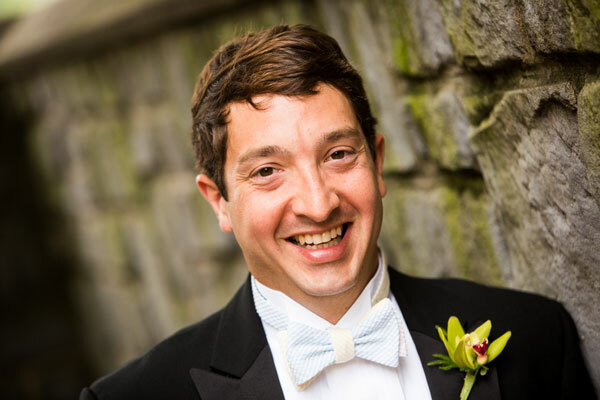 Although they met at Carilion Clinic in the marketing department, Laura and Matthew didn’t start dating until after he’d left to start a digital advertising agency a year later. For the weekend of Matthew’s 30th birthday, Laura planned a weekend trip for him at a bed and breakfast in Clifton Forge, where his family is from. To try and relax before everyone else got there, Matthew suggested they head over to Douthat State Park and look at the leaves. Laura joked that most of the leaves were already gone, so Matthew said they could go look at fish at the dock. Laura agreed, thinking it was his birthday and they could do what he wanted. At the docks, Matthew admitted there was one thing he didn’t get for his birthday. Laura started to panic, thinking there was something she had forgotten for the weekend. Then Matthew got down on one knee and asked her to marry him. The surprises didn’t end there. Matthew had taken a diamond from Laura’s grandmother and had it reset as a one-of-a-kind engagement ring. He had also coordinated with a photographer, and they had pictures of the entire proposal. Upon returning to the bed and breakfast, their friends and family came out to greet them and celebrate the double birthday and engagement. Laura’s father passed away a few years before the wedding, so Laura found a few small ways to honor him throughout the day. Her bouquet included two pairs of blue cufflinks her father had liked to wear, and her dress was embroidered with her father’s initials and the date of the wedding. Laura had resigned herself to not having a “Father/Daughter” dance, but her family surprised her. After her first dance with Matthew, her brother-in-law, two uncles, and three cousins came together with a special dance for her. It moved everyone in the room to tears. Their reception featured stations for food (including a mashed potato bar!) so guests would have several options for dinner and to help keep the evening social. They also had a live band, JukeBoxx, who played everything. People danced all night, even people Laura and Matthew had never seen dance before. Since a lot of their guests were coming from out of town, Laura and Matthew tried to make things easy for them. 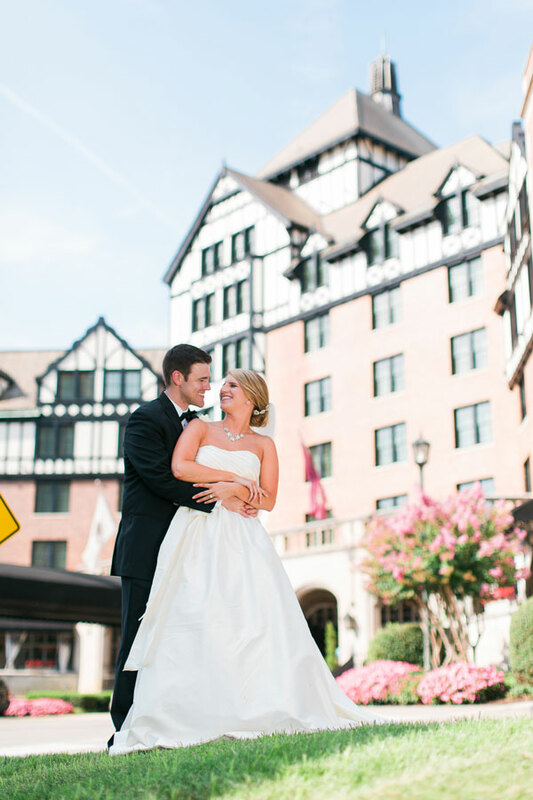 Their reception was at Hotel Roanoke, and a shuttle was available for guests between the hotel and the church where the ceremony was held. When guests arrived they were also given guest bags filled with an itinerary, Friday night dinner suggestions, a “meet and greet” celebration after the rehearsal dinner, breakfast suggestions, and brunch at the hotel Sunday morning. Everything came together to make it a perfect weekend, and the guests had just as much fun as the newlyweds! Make sure to see more of the Sams Wedding on page 80 of bridebook! John and Carter met in 2007 thanks to their families pushing them to meet. For his proposal during a family vacation, John first asked Carter's father and grandfather for her hand in marriage. After their approval, John took Carter for a walk on the beach; they returned to find her family waiting with champagne. Their family and friends played a large part in their wedding, thanks to each of them doing readings, greeting guests at the church and as flower girl and ring bearer. One of Carter's favorite memories of her wedding was incorporating her grandfather into her day - due to a last minute issue, he could not make it to the actual wedding. Carter surprised her family with a life-sized cutout "Granddad" that spent the entire weekend with them at the rehearsal, getting their makeup done, and even dancing at the reception! 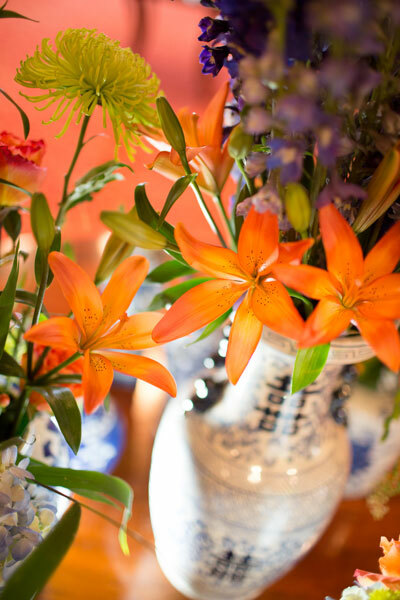 Because Carter has a passion for blue and white, plus John's love of bright colors, they used blue and white urns that he'd collected over the years with flower colors that popped. The blue and white lent to an Asian theme with their decorations and guests were given colorful fortune cookies as favors. At the end of the night when the band announced the last song, the happy bride actually burst into tears because she couldn't believe the night was over. Lucky for her, the band never wants to see the bride cry so they played one more song for her! The couple celebrated their new marriage with a honeymoon to the British Virgin Island, where they relaxed on a peaceful beach. Be sure to see the Hanna wedding on page 72 of the second issue of bridebook, on newsstands now!